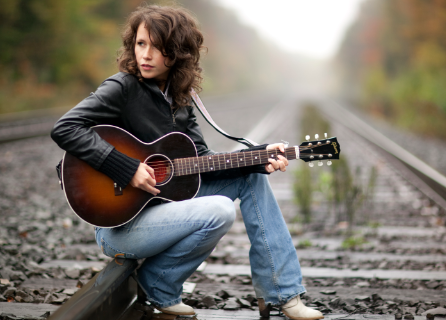 Sarah Lee Guthrie’s lineage is undeniable, the daughter of Arlo Guthrie and granddaughter of Woody Guthrie. But close your eyes and forget that her last name is synonymous with the river-legacy of a widening current of American folk music, chances are you’ll still be drawn to her music and her soulful voice. There is a gentle urgency to her interpretations of the songs she sings and the classic music of her heritage. She has stayed in continuity with her heritage and the river of songs that have guided her to where she now stands. It’s been hinted at since she first stepped on the stages of Wolf Trap and Carnegie Hall as a teenager in 1993 singing Pete Seeger’s “Sailin’ Down My Golden River” for sold-out audiences. It was later, when she met her husband, Johnny Irion, grandnephew of Woody Guthrie’s literary kindred spirit, John Steinbeck, that she began to embrace her birthright and her inherent gifts. On 2009’s “Go Waggaloo” she created a family album of original songs (and a few with Woody’s lyrics) that won a Golden Medallion from The Parents’ Choice Foundation. The tour that followed in 2010, “The Guthrie Family Rides Again,” brought it all together as she found herself surrounded by generations of family and friends all celebrating the music of her family. Sarah Lee Guthrie now ventures on a road that leads back to the rich culture of her family running through the warmth of her own bloodlines. She brings her act to Rockland County January 20, 2018, 7:30 p.m. at the Rockland Center for the Arts. You may purchase tickets at the door for $15.00 or call 845-358-0877. Rockland Center for the Arts is located at 27 S. Greenbush Rd., West Nyack, NY. Regular hours are: Mon-Fri 10-4; Sat and Sun 1-4 pm. For more information visit www.rocklandartcenter.org or call 845-358-0877.